How do you rate "I'll See You in My Dreams! I'll Se you In My Dreams was Doris' eleventh picture. Her growth as an actress realizing the role of Grace Khan is evident in how she emotionally engages the audeince. True to form, Doris is a working woman in early 20th century world of music publishing. 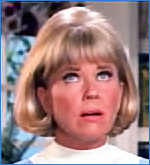 Doris' character has a strong business sense and knows how to guide the success of her husband Gus Khan, ( Danny Thomas). They are a believeable struggling couple. The songs are terrific standards, I'll See You In My Dreams, It Had To Be You (my favouite), Your Eyes Have Told Me So, Memories, and interestingly enough, Love Me Or Leave Me sung by Patrice Wymore to Danny Thomas' Gus Khan. The quality of the film is greatly enhanced by the supporting cast, the delightful wry Mary Wickes who was in the two following Moonlight films with Doris, and Frank Lovejoy who had one of the best lines in the film, " My grandfather started each day with a drink and lived to the ripe old age of 28". Really enjoyable and well done. While waiting in a doctor's office yesterday, I picked up a current copy of People Magazine and there it was--a blurb about Blythe Danner currently starring in a movie called "I'll See You In My Dreams." My immediate reaction was, WHAT??? When I read a little further I found that Blythe Danner is in a new movie by the same name as DD's but it's a totally different story. I would've thought titles were protected, but, maybe not. At any rate, this prompted me to read over all the comments on this forum about the Doris Day/Danny Thomas movie. To my delight, in a posting on 11/25/07 I found a sweet picture of Doris kissing the real Mrs. Grace Kahn on the cheek. It's really lovely. The movie is high on my list too because of all the music in it along with Doris' singing. And the story is about real people which I tend to like. When I first saw the current movie ad for "I'll See You in My Dreams," it surprised me, too. (Couldn't help but wish it had been a re-release of the original.) Re-use of a song title is not a copyright infringement, though, and I think the same is true for film titles. For instance, about 10 years ago Disney produced a movie called "Teacher's Pet." Such a beautiful song and a great movie. Both I'll See you In My Dreams films are well worth seeing. They are both really special in different ways. Oh, look at what you found, Ania!!! Such a fun picture. Thank you very much! The glorious story of Gus Khan, the songs he wrote into America's heart, and the girl who put them into his. Back cover: He penned the lines, Walter Donaldson, George Gershwin and others provided the music. Yet there was a more vital partner in Gus Khan's life: Grace Le Boy Khan who put the love into his songs. Doris Day and Danny Thomas are the Khan's in this affectionate musical, one of 1952's top box-office hits. The title song, It Had To Be You, Makin' Whoopee and Love Me Or Leave Me lead a 23 song cavalcade (in all he co-wrote some 800 tunes) that propels this story of Khan's life from the day he walked into a music publishing house to public triumphs, private failures, career decline and comeback. Directed by Michael Cutiz. this is a winning tribute to a talented guy who put into song what lovers feel in their hearts. It is a heartfelt musical with wonderful songs filled with love and tenderness by Doris DAy. I'll See You In My Dreams opened on December 6, 1951 at Radio City Music Hall for n New York. It toppled all opening week box office records for that theater for twenty years. When Danny Thomas made one of last public appearances on television promoting his autobiography, Make Room For Danny, he struggled to hold back tears when I'll See You in My Dreams was mentioned. 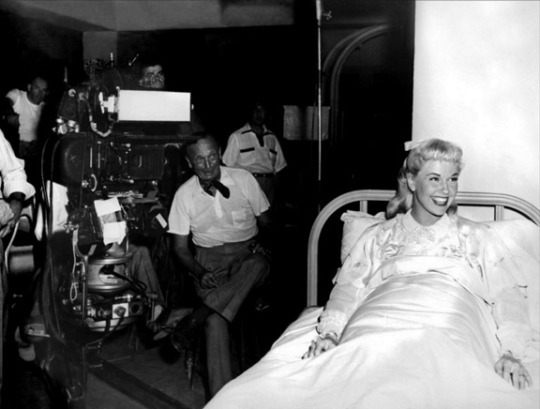 He said it was, "the best thing I've ever done...and with Doris Day". According to Cobbett Steinberg book Film Facts, I'll See You In My Dreams ranked #17 on the list of 1952 top money making films and Doris Day ranked #7 on the list of top ten box office stars. I'll See You In My Dreams earned $2, 900,000 at the box office. The chemistry between leads Doris Day and Danny Thomas in I'll See You In My Dreams really elevates this biography of lyricist Gus Khan. The organic songs grow out of the storyline. A favourite scene of mine occurs early in the film when Danny Thomas' character Gus arrives unannounced at Grace Le Boy's (Doris' character), at dinnertime. Gus is mesmerized by Grace's father reciting poetry. Gus wears the father's tie to dine with Grace's parents. As he is is focused on the father, he does not realize the tie is in his soup. It is a really sweet memorable moment among many in the film. Looking at the film again, I bcame more aware of the level of confidence demonstrated in Doris' character, working woman Grace Le Boy. Doris demonstrated similar confidence in her characters in Pillow Talk, Lover Come Back and Move Over Darling. For anyone who has not seen I'll See You In My Dreams recently, it deserves to be seen again. You will b glad you did. I love everything about this film. Louis Sobol, who for decades wrote a show business column in New York, gave it a glowing report in 1951 when it opened: "A finer picture has never come out of Hollywood." Grace Kahn was an advisor on the movie, and Michael Curtiz's direction was masterful. Time to watch this great classic again! Thanks for pointing us to this film!! "It was quite a human story, and Doris Day and Danny Thomas came across as real people. Part of this may have had to do with the rapport between Doris and Danny. In a letter to the author, Danny Thomas wrote: "Doris Day was a delight to work with and I have the highest regard for her as a performer. All who were associated with the picture worked beautifully together. The "mood" was consistently happy." Mr. Thomas attributes to this esprit de corps the production of a film that went on to break all house records at Radio City Music Hall. Time after time there are similar accounts about how professional and kind Doris was while working with her co-stars. Like Danny Thomas, James Cagney, Rock Hudson, James Garner, Jack Lemon and Polly Bergen all had glowing remarks about Doris. Right you are, Johnny -- and her TV co-stars (Billy de Wolfe, Kaye Ballard, Rose Marie, McLean Stevenson, Jackie Joseph and others) had those same feelings about Doris. I second that, I really enjoyed it and probably wouldn't have thought of watching it if you hadn't selected it, Judy. Thanks again. So glad you enjoyed it, Bryan. There have been so many films based on the lives of people in the music industry, but I think this one and "Love Me or Leave Me" stand head and shoulders above most others. It's a charming movie with surprisingly good chemistry between Doris and Danny Thomas. The songs are wonderful, too! An underrated gem!